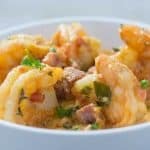 Cajun-style shrimp and sauce with southern-style grits. Using sauté setting - add oil and sausage to Instant Pot. Cook for about 5 minutes, until fat is rendered and edges are crisp. Meanwhile - Add grits to oven-safe glass bowl. Add milk and chicken stock to glass bowl and whisk together. Set aside. Add 3-inch trivet to Instant Pot, then place oven-safe glass bowl with grits on top of trivet. Lock lid and cook for 10 minutes at high pressure. Then allow pressure to release naturally (about 10 minutes). Carefully remove glass bowl from Instant Pot. Add butter to grits and whisk well, making sure to break up any clumps. Then cover until ready to serve. Just before shrimp are fully pink, add cream and mix well. Then switch to warm setting.